An interesting, 2-week long game is being lined up by sports brand to take place in London later this month. Nike Grid takes the idea of Foursquare-style mayorships and badges but adds a twist. 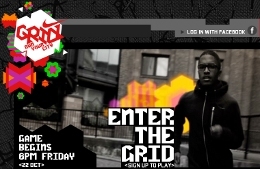 You have to run across 48 London postcodes, filling out an online ‘grid’ and earning points and badges as you run. Here’s how it works: Public phoneboxes around the city have been selected as part of the game. Players must visit a phonebox, dial a phone number followed by their unique user number and then run to another phonebox within the same postcode. Entering their code again there, they earn points for each completed run. A range of badges are available for everything from running before 8am to being the fastest runner in a postcode on a particular day. Additional badges are available for runners that join a team, or run to represent a university or region. This incarnation of Nike Grid is a more ambitious version of the 24-hour game the company ran in April this year. It’s part of wider trend for Alternate Reality Gaming, which combines real-world activities with influences from the world of videogames. The badge-focused ghameplay shows how badges really do seem to be taking over everything. Will ‘Badge Fatigue‘ start to materialise next year? This latest version of Nike Grid lasts 15 days, beginning on 22 October.